Over 30 shooting attacks have been registered since midnight. Three Ukrainian servicemen have been wounded in Donbas since the midnight of 12 March, the antiterrorist operation (ATO) HQ has said on Facebook. "The Russian terrorist troops continue shooting at the ATO positions. Over 30 attacks have been registered since the beginning of the day. Most of them took place in the Mariupol sector where the enemy targeted fortifications near Maryinka with small arms, grenade launchers, and later with 82-mm mortars and a tank," it said. The militants fired with grenade launchers of various systems and heavy machine guns on Shyrokyne, Hnutove and Vodyane. In the Donetsk sector, they used small arms, heavy machine guns, grenade launchers of various systems and 82-mm mortars to target the outskirts of Avdiyivka. A sniper was active near Novotroyitske, an infantry fighting vehicle targeted Zaytseve. Strongpoints near Luhanske were attacked with 82-mm and 120-mm mortars, the ATO positions near Mayorsk with grenade launchers. The militants used small arms against the strongholds near Valuyske in the Luhansk sector. 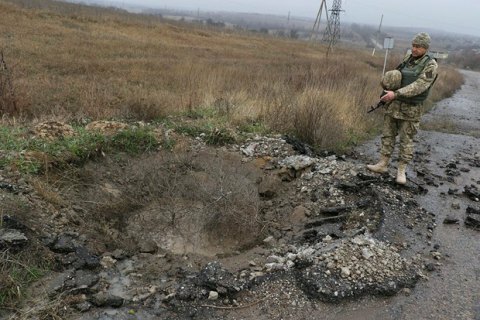 Two Ukrainian troops were killed and one wounded in Donbas on 11 March.